Knee arthritis is characterized by inflammation of the knee, leading to pain, swelling and stiffness. According to the National Health Interview Survey in 2012, more than 51 million people in the US are reported to have some form of arthritis. Knee arthritis is a common form of arthritis and is known to be associated with lost work time in patients. The knee, the strongest joint of the body, holds the thigh bone (femur), shinbone (tibia) and the kneecap (patella). The inner surfaces of the bone at the joint are covered with smooth cartilage, which acts as a cushion to help movement. Moreover, the knee joint has a protective lining, known as the synovial membrane, which secretes a lubricating fluid to reduce friction between surfaces. This membrane releases a fluid that lubricates the cartilage and reduces friction. Commonly, three different types of arthritis affect the knee—osteoarthritis, rheumatoid arthritis and posttraumatic arthritis. Osteoarthritis is caused by regular wear and tear with age, and leads to the gradual loss of cartilage in the knee joint. Rheumatoid arthritis is a chronic autoimmune condition that is characterized by inflamed synovial membrane, and results in joint deterioration. Finally, posttraumatic arthritis develops from injury to the knee. Bone, meniscal and ligament injuries can put additional stress on the knee, which gradually result in arthritis. Symptoms of knee arthritis include buckling in the knee, flare-ups following vigorous activity and locked knee during movement. 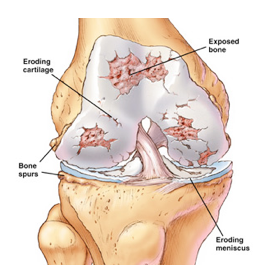 Knee arthritis is diagnosed by physical examination, imaging tests (e.g. X-ray, computerized tomography and magnetic resonance imaging) to detect anatomical abnormalities of the joint, and blood tests to detect autoimmune disorders. Self-care measures for knee arthritis include minimizing activities that worsen the symptoms, weight loss and physical therapy exercises to improve muscle strength and build flexibility. Assistive devices, such as canes, knee braces and shock-absorbing shoes, may improve stability and functionality. Over-the-counter anti-inflammatory pain medications (e.g. ibuprofen) may help with moderate symptoms. COX-2 inhibitors, such as celecoxib and meloxicam, are anti-inflammatory agents with fewer gastrointestinal side effects compared with other nonsteroidal anti-inflammatory drugs. Severe swelling or pain sensation may be controlled with localized injection of corticosteroids. Disease-modifying anti-rheumatic drugs (DMARDs), such as methotrexate, sulfasalazine, help to prevent the progression of rheumatoid arthritis. Etanercept and adalimumab are biologic DMARDs that also slow down an overactive immune reaction, and may help control rheumatoid arthritis. Patients who do not respond well to conservative therapies, may require surgery, such as arthroscopic surgery, synovectomy, osteotomy, and partial or complete knee replacement. Cartilage grafting can also be done whereby healthy cartilage is extracted from another part of the body or from a tissue bank to repair the damaged knee. Recovery from surgery is a lengthy process, which greatly depends on the extent of damage and overall patient condition. 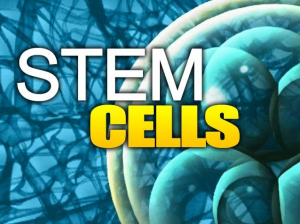 Stem cells are primitive cells present in the body that can undergo differentiation to form different types of cells, such as bone, tendon, cartilage, ligament, etc. 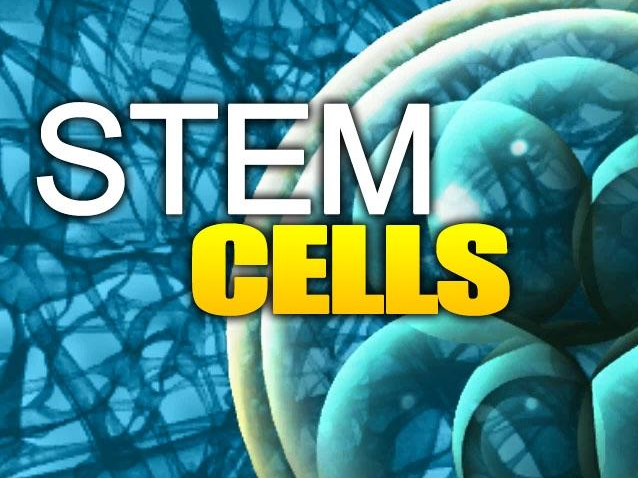 Stem cells hold the potential to repair and regenerate new healthy cells at sites of tissue damage. Research has shown that the transplantation of mesenchymal stem cells (MSCs) in osteoarthritic patients increased cartilage thickness and facilitated tissue repair over a period of one year. Mesenchymal stem cells can easily be extracted from the patient’s bone marrow or fat deposit. This type of therapy is well-tolerated in patients, and there is no risk of immune rejections. At R3 Stem Cell Clinics, we follow FDA guidelines to extract stem cells from patients and deliver them in high concentrations at the site of damaged joint. In addition, we use platelet-rich plasma (PRP) therapy, either alone or in conjunction with stem cell therapy to promote natural healing. PRP is a combination of growth factors and platelets derived from the patient, which nourishes stem cells to grow into new healthy cells, such as cartilage, tendons, ligaments. Additional options include amniotic derived stem cell therapy along with adipose (fat) derived stem cells. The amniotic tissue is obtained from consenting donors after scheduled c-sections. No embryonic stem cells or fetal tissue are used, which negates any ethical issues. Unlike surgical interventions that are associated with a long recovery, stem cell therapy can be performed as an outpatient procedure. Moreover, these cells enable natural and complete healing of the degenerated joint. Patients taking steroid injections to reduce painful arthritis swelling, may benefit from stem cell therapy. Not only do these cells regenerate the damaged area, they secrete anti-inflammatory factors, such as cytokines, that help alleviate symptoms. It is possible to avoid the detrimental side effects of steroids using stem cell therapy. No evidence of serious adverse effects have been reported so far with the use of stem cell therapy. Pak J, Lee JH, Lee SH. Regenerative repair of damaged meniscus with autologous adipose tissue-derived stem cells. Biomed Res Int. 2014;2014:436029. doi: 10.1155/2014/436029. Epub 2014 Jan 30. Anz AW, Hackel JG, Nilssen EC, Andrews JR. Application of biologics in the treatment of the rotator cuff, meniscus, cartilage, and osteoarthritis. J Am Acad Orthop Surg. 2014 Feb;22(2):68-79. doi: 10.5435/JAAOS-22-02-68. Emadedin M, Aghdami N, Taghiyar L, Fazeli R, Moghadasali R, Jahangir S, Farjad R, Baghaban Eslaminejad M. Intra-articular injection of autologous mesenchymal stem cells in six patients with knee osteoarthritis. Arch Iran Med. 2012 Jul;15(7):422-8. Dhinsa BS, Adesida AB. Current clinical therapies for cartilage repair, their limitation and the role of stem cells. Curr Stem Cell Res Ther. 2012 Mar;7(2):143-8. CALL R3 STEM CELL TODAY TO FIND OUT HOW REGENERATIVE MEDICINE CAN HELP YOU DELAY OR AVOID THE NEED FOR A TOTAL KNEE REPLACEMENT AT (844) GET-STEM!